Firefighters stand by the gutted remains of the bus in San Donato Milanese, near Milan. A BUS DRIVER in northern Italy abducted 51 children and their chaperones earlier today, threatening them over a 40-minute ordeal before setting the vehicle on fire when he was stopped by a Carabinieri blockade. De Marchis told Sky TG24 that the driver, an Italian citizen of Senegalese origin in his 40s, threatened the passengers, telling them that “no one would survive today” as he commandeered the bus carrying two middle-school classes to a nearby gym in Cremona province, some 40 kilometres from Milan. The prosecutor’s office later said they would add terrorism as an aggravating circumstance since the event caused panic. ANSA reported that Sy, who became an Italian citizen in 2004, had been convicted in 2007 and 2011 of drunken driving and sexual molestation of a minor. Sky TG24 said that the driver had worked for the bus company for 15 years without any employment-related issues. 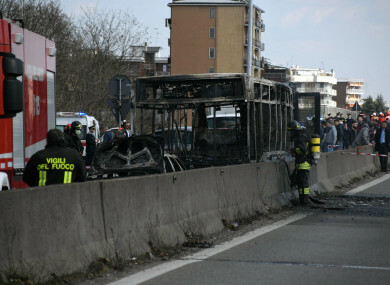 Email “Driver abducts 51 schoolchildren in Italy and sets bus ablaze”. Feedback on “Driver abducts 51 schoolchildren in Italy and sets bus ablaze”.